Inder Verma, PhD, the Irwin and Joan Jacobs Chair in Exemplary Life Science, Professor and Director of the Laboratory of Genetics at the Salk Institute for Biological Sciences, and an American Cancer Society Professor of Molecular Biology took his Vallee Visiting Professorship sabbatical this summer in Cambridge, UK. The Laboratory of Molecular Biology (LMB) has hosted a number of Vallee Visiting Professors over the years, most recently David Eisenberg (see link). Dr Verma was hosted by Professors K J Patel and Venki Ramakrishnan, and was made a Fellow of Gonville & Caius College by Professor Sir Alan Fersht (VVP 2008) who welcomed him to dinners in Hall and arranged accommodation in College. 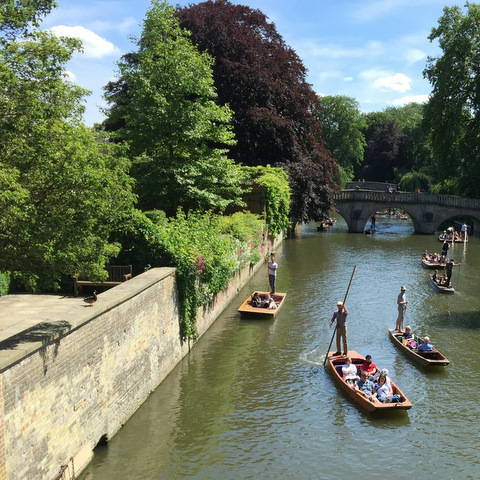 Inder’s month in Cambridge was divided into two sections because of a previous commitment to spend a week in St Petersburg. The purpose of the VVP sabbatical is to establish and strengthen collaborative relationships, exchange scientific views and explore new concepts and ideas through participation in colloquia and meetings with scientists, scholars, and students at the host institution. The rich intellectual community at the LMB provided ample opportunity for discussions, both formal and informal, with senior scientists and students on topics ranging from structural biology, cell biology, microbial genetics, DNA repair, cancer genetics and bioinformatics. In addition, Inder gave a number of seminars on cancer stem cells and gene therapy in Cambridge, Oxford and London. Embracing Cambrian style transport, Inder’s daily commute was by bike; he regrets that he did not get a chance to try punting.